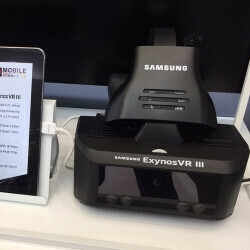 Thanks to Korean firm Visual Camp, we get our first glimpse at a reference variant of the Samsung Exynos VR III head-mounted display – a standalone unit with built-in displays that connects to a smartphone through the USB port. This is considerably more sophisticated technology than the Samsung Gear VR, which requires mounting the entire smartphone in the headset's front. Visual Camp boasted about having their eye tracking technology integrated in Samsung's HMD. The system is designed to sharpen the resolution of the part of the display being viewed by the user's eyes, while reducing the resolution of other parts. This supposedly helps with immersion. Additionally, the HMD features hand tracking, voice recognition, and facial analysis technologies. It's powered by the Exynos 8890 chip that runs in the Samsung Galaxy S7 and S7 edge. With Samsung having a new reference platform for VR and eye tracking, it's only a matter of time before the technology reaches the mass market. But someone also needs to produce the content to give this technology meaning. That, too, is a question of time. Jun 21, 2017, 9:04 AM, by Simon K.
The new gear vr iii is powered by exynos 8895 with mali-g71 , its written in the tablet next to it . I think the VR 3 would use two ARM SoCs this time. Considering there is a ton of processing for only one ARM SoC. Remember live image processing with eye and hand tracking alone take a lot of the CPU power alone. Then you also have to have fast VR processing and rendering as well. They are probably using two ARM SoCs. The Exynos 8890 is used for the eye and hand tracking. The other SoC is probably a SD 835 or another Exynos SoC used for all the graphics rendering and processing. That makes sense. However running the existing Gear VR (Oculus) software with a sustainable 60 fps, then adding both eye and hand tracking as well. Is really too much. Think about it, image processing is be used for not only the your eye tracking, but the users hand tracking in front of the VR headset. Another VR company Fove has been working on eye-tracking for years. Their eye tracking allowed only the area that you're looking at to be rendered in full resolution. The remainder of the screen could be rendered lower resolution without the user noticing because it's peripheral vision. Fantastic concept because you could get a higher resolution experience with lower processing power requirements. The difference is that the Fove is a PC solution like the Vive/Rift rather than mobile. It's mobile that will take over the vast majority of VR/AR/MR. As it stands today PC VR solutions only take a fraction of the existing VR market share. Yeah, being tethered to a massive PC is a bit of a pain. You can guarantee that the PC version will be way better that mobile but nowhere near as convenient.